I got the Zombology artwork from the printers back in August, the day before I left on a week long family holiday. In the intervening two months I've been on holiday twice and away for work a few times, the baby's had a filthy cold that wrecked our sleep for a couple of weeks and I've still managed to make over 36 games. That's 27 hours of games crafting! These are now available for sale! This week I cleared the last of the pre-orders so I finally have games in stock (and a personal demo copy!). This means a few things - I've finally made the game available for sale (rather than pre-order) on my website and added it to the BGG Marketplace and I can also start trying to push it a bit harder - I didn't want to put too much effort into marketing when I didn't have the copies available for sale as that would just delay getting to the point where I had games for sale. I need to get better at driving interest online for Zombology - especially trying to find the people it would appeal to and getting it in front of them. The other thing I need to do more of is getting out there and playing Zombology with people. It's been one of my most successful routes to getting pre-orders and it should be easier to get people to part with a tenner for a game in hand rather than sign up for (and then later confirm) a pre-order that could be months away. I fulfilled all the pre-orders before making my copy, but now I've got that (and some stock) I can start trying to go to conventions and games clubs and playing it with random people. Following on from last week's blog about why I've gone down the route that I have and what my long term goals are I thought it would be good to share what my goals for this year are. In my head the year runs from September (when I started genuinely making Zombology) to August rather than the calendar year or the traditional April-April financial year. This time round I'm trying to be a bit more business-like than I was with Reiver Games. I've got a business case I've written with sales predictions, costs and planned actions and risks. Success for me is not based on the reception of Zombology directly, though the criteria will only be met if it's fairly well received. Zombology is a niche game that's likely to be a bit love/hate with people. One of the advantages of a small print run is that I can make more unusual, interesting games, ones that might not succeed as mass-market games. Some people like a zombie theme, others hate it. Semi-cooperative games are a turn off for a lot of people. Some people might find it too deep/complex for what is a 10-15 minute game once you know how to play it. I'm hoping that most of the people who buy it enjoy it and are happy with their purchase, but it's hard to treat that as a success criteria, and I don't want to rely on something like BGG scores as a proxy. So the obvious measure is sales. My business plan has me selling 135 out of the 200 copy print run by the end of August next year. That's five a month most months with the exception of the pre-orders and launch buzz in Sept/Oct and Christmas in December and an aggressive target of 50 sales at the UK Games Expo next year. Not quite on target yet! In the days of Kickstarter goals are not enough. You also need stretch goals. So let's throw a couple of those out there too - one that's tough, but might be within reach and one that's crazy hard. Stretch Goal 1 is to sell the whole 200 copy print run within the year - i.e. by the end of August 2018. That's tough, but not impossible I think. I sold 300 hand-made copies of It's Alive! in 2007-08, for £15 each, so 200 at £10 should be distinctly possible. Obviously it's a different, more niche, game and there's a lot more competition these days thanks to Kickstarter. Also, I've a young family at home that I want spend quality time with, so there's more time pressure on the crafting, marketing and selling than there was back in the early days of Reiver Games. Stretch Goal 2 is pie in the sky, but if you don't dream big you'll never get there. Stretch 2 is to get Zombology picked up by another publisher for a professional run after I've finished the hand-made run. I'm not going to put any effort into this, so I'll not be submitting it to publishers or hawking it to them at conventions. The only way I can see this working is if Zombology gets great reviews on BGG or similar or if someone who works for a publisher orders it and really likes it (that happened for It's Alive! - I had the chance to licence it to another publisher, but back then I wanted to be the professional publisher, so I said no). So there we are - that's what I'm trying to acheive. Wish me luck! Any advice greatly appreciated. A couple of weeks ago I talked about how I was forming a Board of Advisers to help provide input on my plans and give me advice on how to be more successful. I sent the first report to them last week and got some really useful feedback, including a long email from Brett Gilbert, designer of Divinare, Elysium and Professor Evil and the Citadel of Time. I've know Brett since my Reiver Games days when he submitted one of my favourite prototypes to me. He lived fairly locally, so we met a few times to discuss it, but sadly it went no further. In the meantime, Brett has co-founded the Cambridge Playtest UK group, been recommended for a Spiel des Jahres for Divinare and nominated for a Kennerspiel des Jahres for Elysium. So he struck me as a perfect candidate for the Board, and I was delighted when he accepted. His response to that first report was great, it really made me think about why I'm doing this. I've reprinted (with his permission!) an excerpt from his email below, along with my response - since I figure you guys might be interested too! Perhaps the biggest question that this report doesn’t answer is what your long term goals are. You have a clear focus on hand-crafted games (and that’s a noble aim! ), but you also raise the threat that a crowded internet space, in which other creators are drowned out by the noise of big Kickstarter campaigns, puts on your ambitions. KS is here to stay, and it has completely changed the landscape. The best thing about the internet, as someone once observed, is that it makes everyone a publisher; and the worst thing about the internet is... that it makes everyone a publisher. Why are you laboriously hand-crafting games if your finished product is designed to look just like something that’s mass-produced? 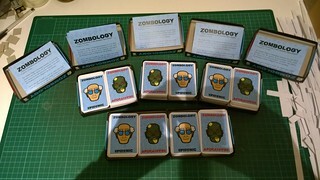 Zombology seems to be a POD product, just with *way* more leg-work for you. There are few exemplars of artisanal game-makers; indeed the only one I can think of is Gavin Birnbaum (Cubiko, Jam Sumo) — but he literally hews his games from lumps of wood, crafting objects with the spirit of a piece of art. That’s his thing, and he does it really well (and Jam Sumo is an absolutely cracking game), but every single one of his ‘pieces’ are unique and literally unattainable by other means — and buyers know that; they *feel* it. It takes him all winter to make 30 games. Their preciousness is *why* they are sought after — but also the thing that limits his success. Do you expect — *can* you expect — your buyers to have the same reaction to a box of Zombology? This may feel like too harsh or too profound a judgement, but if you want to become an artisan rather than just a designer or a publisher, then the soul (for want of a better word) of your product has to be the thing that sells it. But if your goal is to make games — rather than crafted objects that are *also* games — then it seems as though hand-crafting your games will only slow your ambitions down. I appreciate that this may not be the sort of feedback you were hoping for. But I hope there is something here to inspire you! You’ve raised a couple of great questions and ideas there, ones that deserve a reasoned response. I’m a maker of things. At times it’s been (bits of) computer games, game designs, painted miniatures, mini scenery, hand-crafted games, mobile apps and hand-crafted games again. I’m much happier making something that I can be proud of than reading a book or watching TV or a movie. In the words of Race for the Galaxy I would rather Produce than Consume. I enjoy designing games, I enjoy playtesting them. I love doing the graphic design (though I’m not great at it) and will give doing the art a go too (I’m pretty bad at this though, see Border Reivers and Zombology). I also love physically making games. Yes, it’s hard work and yes it’s time consuming, but I enjoy doing it, and doing it well so that I can look at the final product and be proud of the quality I’ve achieved. You describe three different routes: the standard publisher/Kickstarter, my halfway house with hand-crafted games that aim for almost professional quality and hand-crafting works of art like Cubiko. Why have I chosen the route I have, and where am I aiming to take this? I’ll answer the first one first! I’ve got previous self-publishing games. One of the things I learnt during my Reiver Games days is that I’m a pretty bad judge of what makes a popular game, more so if it’s one I’ve designed myself and I don’t have the distance to be able to judge objectively. To Kickstart a game successfully you need great art (which I can’t do, so I’d have to pay for) and to be a great marketer (which I’m definitely not). 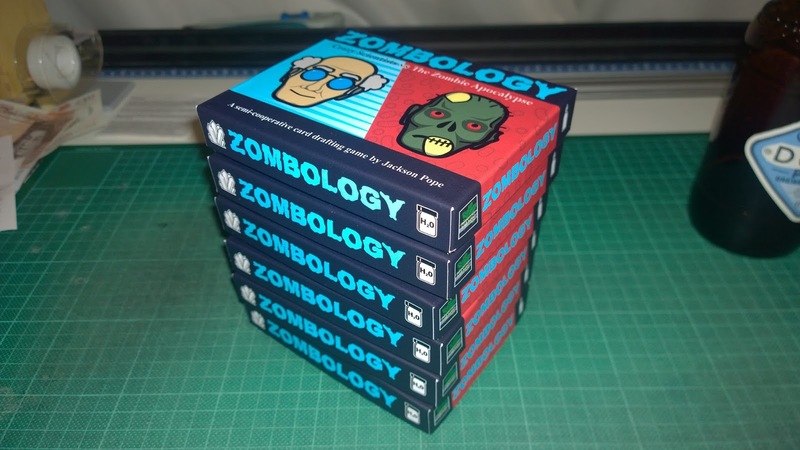 I could easily throw a few grand at trying to Kickstart Zombology and fail due to my own shortcomings as a marketer, regardless of the quality of the game. I’m also uncomfortable with the ‘money up front before the product exists’ model of Kickstarter. The effort required to fulfill a Kickstarter quanity of orders and then try hawking the remaining stock to distributors and shops is also more time than I’m prepared to invest around a young family and a busy job with a reasonable amount of work travel. The route I’ve chosen is also quite a lot of work, but I know exactly how much (it’s going to take 150 hours to make the print run) and it’s something I’m good at and enjoy. Sure, the fact that I’m only making a few games a week is slowing me down, I could sell the games faster if they were in boxes filling my garage (like the good old days!). But this is a halfway house and I’m reasonably confident I can sell 200 games (I’ve sold 300 hand-made games in a year before, though admittedly before Kickstarter). The true artist’s route would require a different type of game, maybe I’ll design one of those in the future, but the only way I could do that with Zombology is to hand-paint the cards and I don’t have the skills for that. To answer your second question (what are my long term goals), I want to continue sharing my games with gamers and hopefully bringing some fun to their lives through my games. I've invested £1,000 in the company. That's a chunk of money: not so much that I'd cripple myself if I lost it all but nor is it enough to do much in the games business. I've a plan I think I can deliver in 2017/18 to turn that into a slightly larger pot of money. If Zombology does well, I'll have more money to invest in my next game and so on. 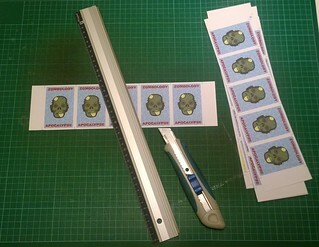 The hand-made print run is small enough that I believe I can sell it all, but large enough that the economies of scale mean I can do it at a reasonable price and still make a profit. Over time maybe I can build up enough reputation, brand awareness, customer loyalty and cash on hand that I can do a larger, professional print run, but unlike last time I do not want to rush it and end up losing money. If Zombology is hugely popular then I'm happy for someone else to publish it via Kickstarter or whatever, but that's not what I'm good at or nor what I want to spend my evenings doing. I've got a day job that pays a decent salary and a family that I have a responsibility to help support. I'm not looking to quit my day job and start a publishing company again. Last time I invested a huge chunk of my life insurance payout and lived off another chunk for a couple of years. I didn't earn a salary for two years and managed to recoup only a third of what I'd invested in the company. Two years without any earnings, pension contributions, etc. I'll not be doing that again. I want to create a company that lets me fund my games design hobby, slowing growing over time while allowing me to share my designs with gamers so that those games can live outside of my games room and hopefully bring some fun to gamers I don't know and will likely never meet. 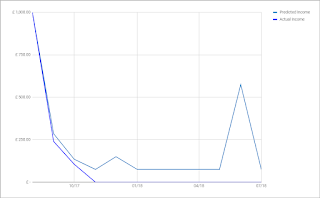 Eurydice Games is just over two months old and has completed its first calendar quarter. It's been a busy one, with most of my focus (unsurprisingly) on Zombology. At the very end of July I officially formed the company and requested a bank account. During a busy August I spent a week in the US for work, then ordered and collected the Zombology artwork from the printers and then went to The Netherlands for a week's holiday. When I got back I could finally crack on. The website went live, I shipped the proof copy to Derek (who didn't get either of the versions I had previously sent him due to the vagaries of the South African postal service) and I began making copies in earnest. September was all go. I had intended to make 23 copies (which I did with 1.5 hours to spare!) and ship the first 20 pre-orders. With a busy first couple of weeks (four evenings written off by work travel, friends visiting for a weekend and preparing for Daughter the First's birthday party), I got off to a slow start, but things soon picked up. It turns out the 4.5 hours I need to make six copies equates to three or four post-bedtime evenings (by the time we've got the kids to bed, eaten and tidied up there's not a lot of time before I need to go to bed, seeing as I can be up very early with Daughter the Second). So the second half of September felt like I hardly saw The Wife, but I got it done. I think that now I've nearly fulfilled all the pre-orders I'm going to slow my construction down to six copies (the number of boxes I can make from a single sheet of SRA2 greyboard, and hence my batch size) every ten days, rather 6 copies every seven days - that way I should be able to cram in some time with the family too. 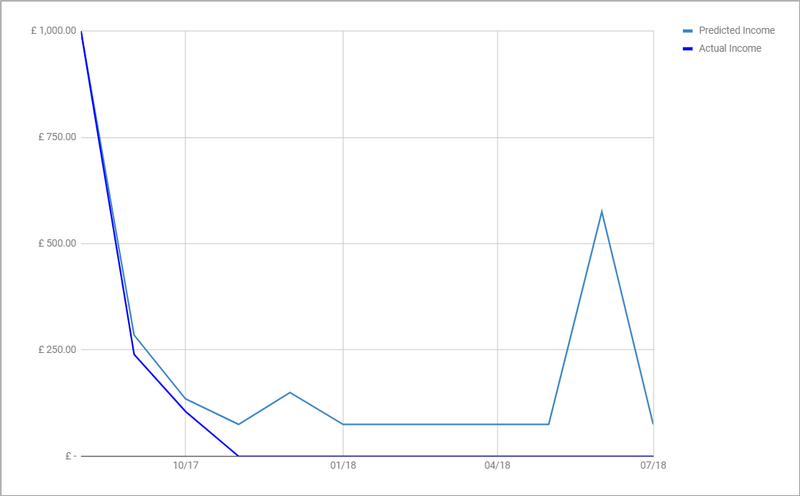 I didn't quite hit the target of 20 sales (I had enough games and enough pre-orders but a couple of the pre-orders have gone dark and probably won't actually buy and I was trying to only email people when their copy was ready to post, so it moved quite slowly from my end). Things are looking pretty good for October, I've already sold five of my target of 12 and have another six pre-orders I'm confident that I can sell to and deliver this month. By the 20th I hope to have built up stock for the first time, at which point I can make it for sale on my website and the BGG marketplace. I'm also hoping to get a couple of reviews in the next few weeks, which might lead to some sales if I'm lucky! 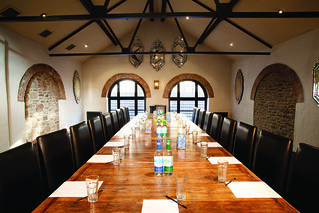 One of the advantages of running a larger company is that you have people around the office to bounce ideas off and a corporate board to whom you are accountable. As a sole trader, I have neither of those things. So I've decided to form a board of advisers instead. I've invited a group of friends whose opinions I respect, plus designers and publishers I know and a couple of people with business experience. Unlike a corporate board these people have no legal responsibility and will not get vast wealth through share allocation - they are just doing this as a favour to me, for which I am extremely grateful. Obviously I don't want to take the mick, so I'll just be sending them a quarterly report of my progress, successes, failures and challenges and hopefully I'll get some other perspectives and great advice as a result. The first report goes out this week, I'm excited to see how their different viewpoints can help me be more successful.